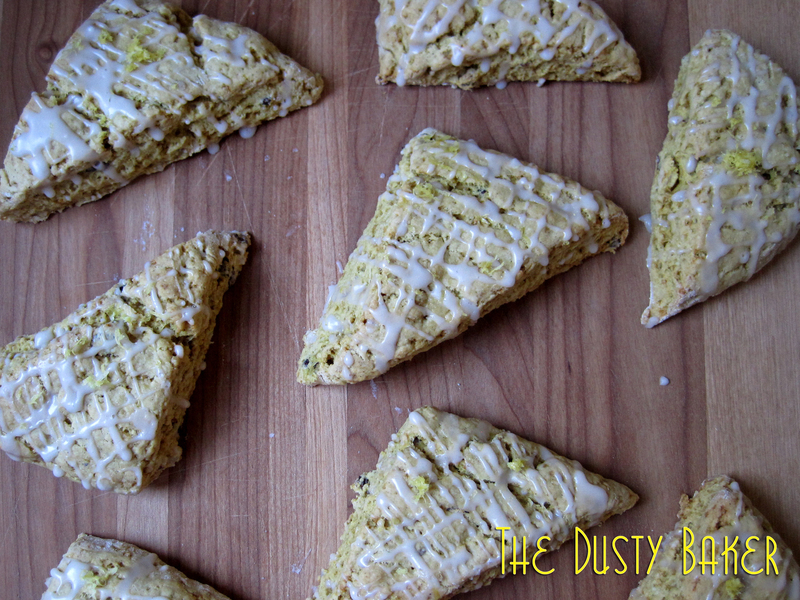 So I made a gluten and dairy free version of the Lemon Genmaicha scones I made last week, bumping up the lemon flavor in both the scone and the glaze and adding a few drops of the hazelnut extract I finally found at the NY Cake Company store downtown (if you’ve never been, go). 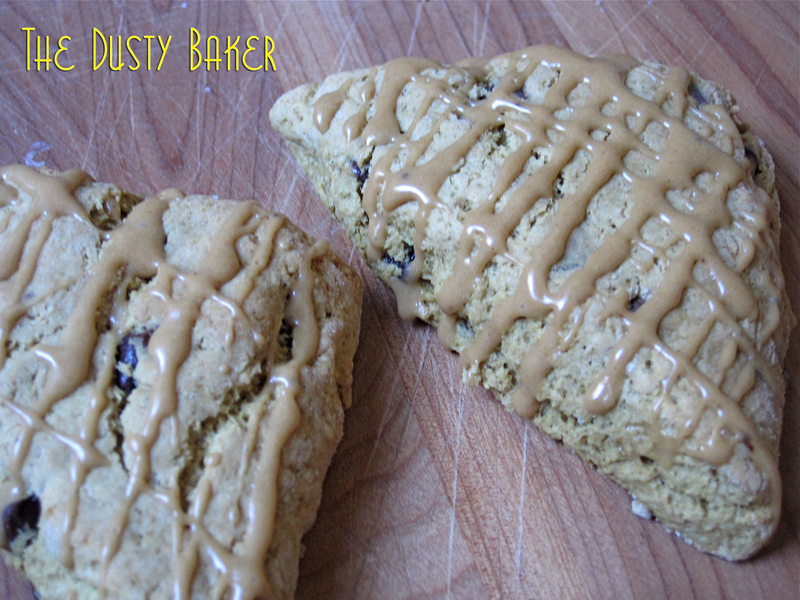 And to do away with the demon bag of chocolate chips that has been haunting my kitchen, causing me to grab little palm-fulls at a time and then shake in a hypoglycemic hissy fit, a batch of mochaccino scones suddenly started appearing between my fingers. Now, these are scones. A somewhat traditional scone in that they’re less sweet and bit more crumbly than our American version that adds sugar and fat to everything. But I hope they still satisfy. And as I couldn’t sample one (made with cow’s milk), I’ll trust my roommate that they’ll not embarrass either of us tomorrow. Dissolve 1 tsp of instant coffee in milk and set aside. Sift flours, baking soda, baking powder, xanthan gum and salt in a large bowl. Cut in butter and blend with fingers until mixture becomes crumbly. You could do this by pulsing in a food processor or standing mixer, but why not save the equipment and enjoy feeling flour between your fingers? Just do this as quickly as possibly so that the heat from your hands doesn’t melt the butter too much. Add sugar and chocolate chips and stir in. Make a well in the center and add egg, vanilla and coffee milk. Stir together with a fork until the mixture just pulls into a dough. Turn onto a floured board and knead briefly, until the dough is smooth, about 6 kneads or so. Stretch/roll into a log about 4 inches wide and pat dough down to about 2 inches thick. Cut into eight triangles and place on thick baking sheet. If desired, brush the tops with a little milk or beaten egg. As you’re going to glaze the tops, this isn’t necessary but will add a touch more sheen. Bake for 8 minutes, turn pan and bake for another 8 minutes or until the tops are slightly brown and the pastry gives only slightly when pressing. Cool for a few minutes on the pan and then remove to rack. For the glaze, dissolve 1 tsp instant coffee into 3 Tbsp milk or cream and add chocolate extract. Slowly pour into powdered sugar while whisking until smooth. Drizzle over cooled scones and allow to set for several minutes before serving.